100 Best AppInventor Tutorial Videos | Meta-Guide.com. 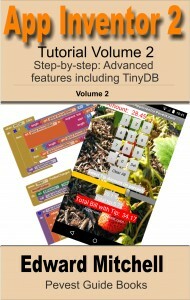 App Inventor provides Lists, plus you can also use components like the TinyDB. 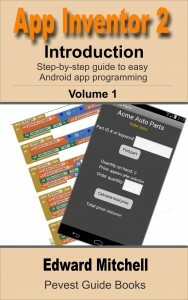 For a detailed description of using Lists, please refer to Chapter 8 – Introduction to Lists in my e-book “App Inventor 2: Tutorial”, available for $2.99 from Amazon. I hope to make this text available in additional e-reader formats during November. 99+ MIT App Inventor Forum – Google Groups. This is the MIT App Inventor Support Forum, hosted on Google Groups. This is a place to find answers to questions you might have. This block can be inserted anywhere a processing block is allowed such as the result of an if-then-else conditional block. You can also change the text or background color of the app to something more interesting than the “black and white” default colors shown in this example. 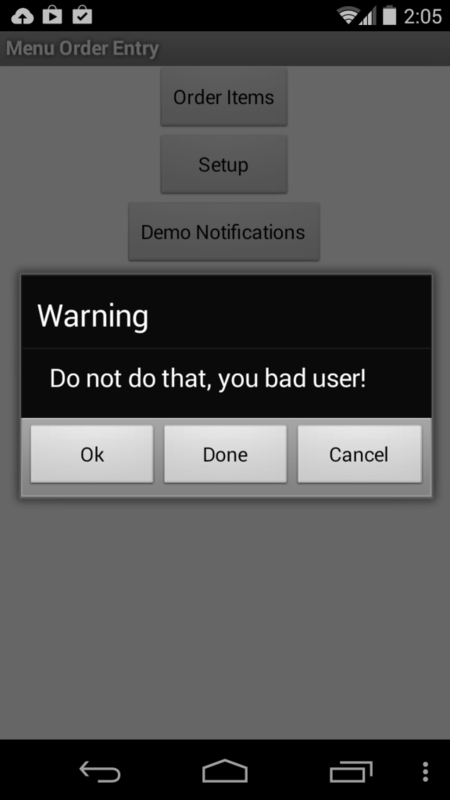 Notifier provides a quick and easy way to display short alert messages to the user of the app. Update: When the program is run in AI2 Companion, it behaves differently than when run as a standalone “build” .apk app. CLICK HERE FOR A MAJOR UPDATE TO THIS TUTORIAL ON TEXT FILES! The updated tutorial explains where – and why – the files you create may appear to be hidden on the phone – how to find them and how to transfer the files to your PC. 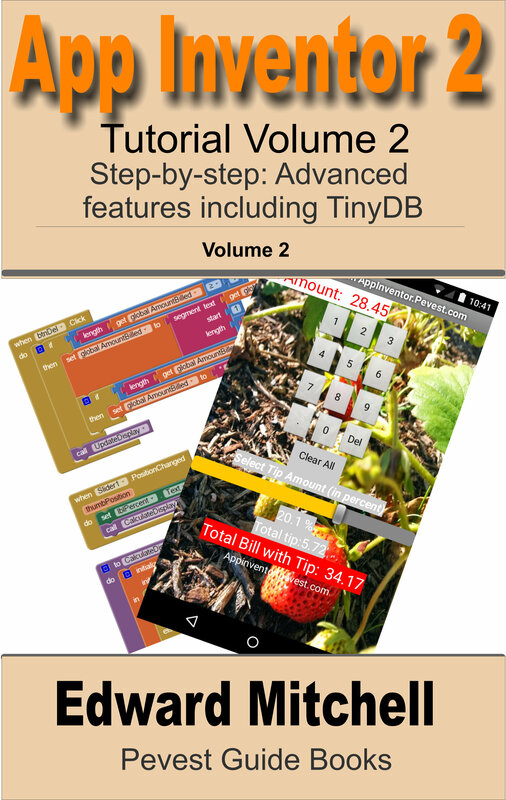 An earlier blog post described how to store data using TinyDB so that an app’s data can persist between uses of the program, or even to share data between screens in a program. Let’s start our exploration of the File control in the Designer. Beneath the Palette heading, find the Storage item. Within Storage, find the File control. Drag and drop the File control on to your app. 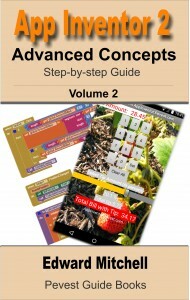 The control is placed below the user interface as it is an invisible control. txtBoxResult1 and txtBoxResult2 – a couple of text boxes that can be used to display the values read from the file. btnAddItem.Click is an event handler and you should already be familiar with the concept of event handlers. The new features are those in purple, which reference the File1 control. Assuming you are implementing this in your own app, you should find the File1 control, probably at the bottom of the list of Blocks, at the left side of the Blocks editor. 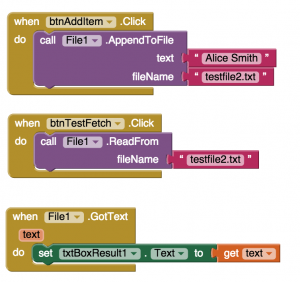 The first purple item above, AppendToFile, writes a piece of text to the file indicated at the filename component. Writing to the file is the easy part! When our app’s TestFetch button is pressed, the code initiates a read operation by reference ReadFrom and giving it the name of the file to read the data from. But at this point, the data has not yet been read! When the data has actually been read, an event occurs and we need to add an event handler for GotText to process the data that has been read in to the app. In the example above, the original text is read back from the file and placed in an on screen text box to illustrate success. Writing and reading a single line of text is easy. But writing and reading a series of data elements is a bit more complex. There are several possible ways to handle this but I have chosen to use the mechanism. Find your screen’s name in the Blocks list and then click the mouse over the screen name. You should see the Initialize event handler appear in a pop up list – drag that initialize block over to the Blocks editing window. Let us now take a look at writing a list – or list of lists to the text file. You’d best be familiar with lists (see volume 1 of my App Inventor 2: Tutorial) before starting on this. For this example, we want to store a typical name/address combination. This means storing several items for each individual record – in our example, we have two individuals but this could be easily expanded to support more. The first block creates two lists (at far right) – one list per person to combine the name and address. Think of this as being like a spreadsheet with rows and columns, if you prefer. All those blue list processing blocks are converting our text input at right, into two CSV rows, combining those into a list, and then converting to a table. 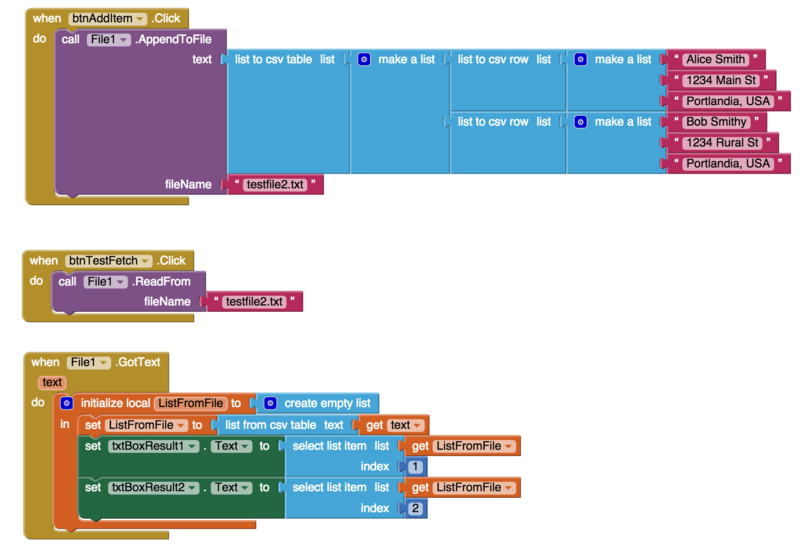 That’s a lot of work but its just a way of storing our more complex data into the file. At the bottom block, the data read from the file is converted from text back in to table list format. And after this is done, individual list elements can be referenced. Since this table has two rows, index position 1 and index position 2 refer to first and second name records. Since each row is itself a list, we could also select the individual items from each name/address record if we wanted (but that is not shown in this example). App Inventor’s new File control is helpful but remains cumbersome to use, as shown by the effort to read and write complex records. It works only with text (which is how most of App Inventor works) and it reads the entire file all at once, rather than reading a line at at time. This limits the total size of the file that we can likely handle (maximum size is not known). On my Nexus 5, there is a visible folder named AppInventor, and within that folder, there is a folder labeled data. This is where testfile2.txt is located. This location also corresponds to /storage/emulated/0/AppInventor/data, a folder on the phone. You’ll need a file explorer app – or connect your phone to a PC using a USB cable and mount the phone as an external hard drive – to see the file structure on the phone. 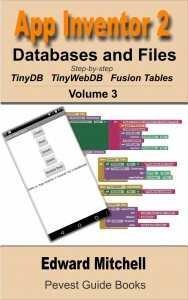 My 322 page e-book provides extensive guidance on App Inventor databases and files, including TinyDB, TinyWeb, Fusion Tables and text files. 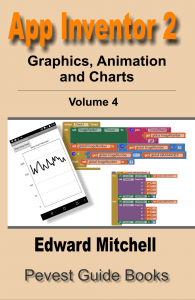 Learn about all my App Inventor guide books, including sample chapters – here!